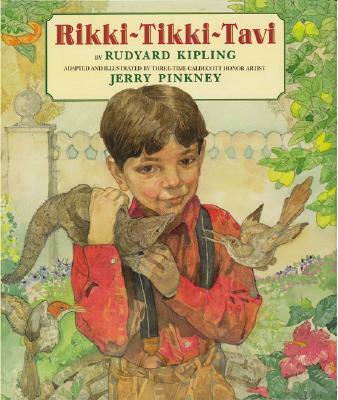 A classic story from Rudyard Kipling's The Jungle Book, adapted and illustrated by award-winning artist Jerry Pinkney, this is the tale of Rikki-Tikki-Tavi, a fearless young mongoose. Soon after a flood washes Rikki into the garden of an English family, he comes face-to-face with Nag and Nagaina, two giant cobras. The snakes are willing to attack Rikki, and even the human family who lives there, to claim the garden and house for themselves. But they do not count on the heart and pride of the brave little mongoose. Rudyard Kipling was born in Bombay (now known as Mumbai), India, but returned with his parents to England at the age of five. Among Kipling’s best-known works are The Jungle Book, Just So Stories, and the poems “Mandalay” and “Gunga Din.” Kipling was the first English-language writer to receive the Nobel Prize for literature (1907) and was among the youngest to have received the award.